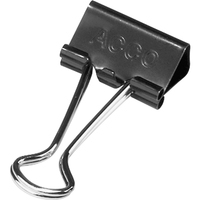 Reusable black binder clip with silver arms securely fastens stacks of paper. Tempered steel provides extra strong hold and clips spring back into shape when removed. Non slip grip does not weaken over time. Rust and scratch resistant materials. 12box.